The lovely Leslie of Definitely Not Martha chose the perfect theme for a November Sugar High Friday: The Beta Carotene Harvest. The hardest part was just choosing a recipe with so many luscious possibilities! In the end, I decided to go traditional and make the same old paradise pumpkin pie I’ve baked for the last few years on holidays. 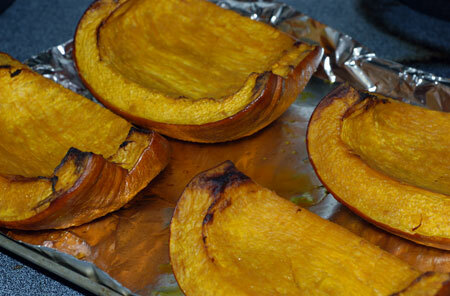 I did make things a little more interesting for myself by roasting a sugar pumpkin and making my own puree. 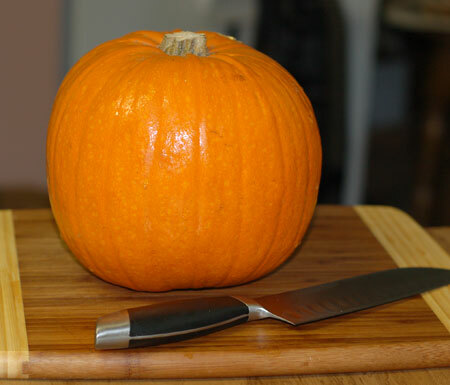 There’s not much to it, as it turns out—at least once I got my husband to quarter the very sturdy little pumpkin for me. Once roasted, the pumpkin flesh reminded me of nothing so much as orange hash brown shreds. I forgot to weigh my pumpkin before cleaning it, but it must have weighed around 4 pounds. 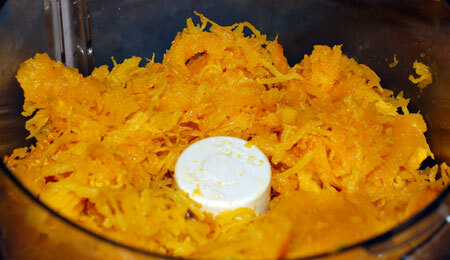 After roasting and whizzing the pulp in the food processor, I finished with about 2 pounds of puree. As I mentioned, I’ve made this pie several times. 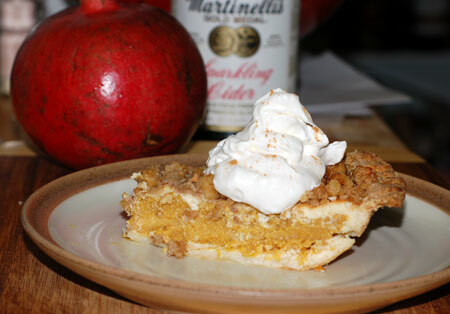 It has a cheesecake layer topped with a pumpkin custard layer, finished off with walnut streusel—very festive, and it strikes a good balance between your traditional pumpkin pie and something a bit more unusual. I’ve never had trouble with the layers marbling in the past, but I make sure the cream cheese layer is as set as possible before pouring on the pumpkin. A short stint in the freezer helps with that. In this case, I think my fresh pumpkin puree had more moisture in it than your standard canned pumpkin, and I’ll drain the remaining puree before using it in other recipes. It made my custard layer loose enough to swirl entirely through the cream cheese and sink below it. It still tasted as good as always, just not especially impressive to look at. Cheesecake Layer: In a medium mixing bowl, beat cream cheese until smooth. Beat in sugar, then add vanilla and egg. Beat mixture until light and smooth. Chill mixture for 30 minutes, then spread into pastry shell. Place in the freezer for about 20 minutes to firm up (a longer while in the refrigerator would work as well). 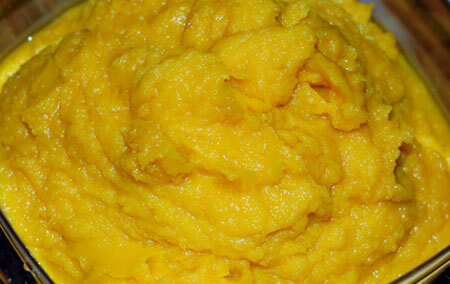 Pumpkin Layer: In a large bowl, combine pumpkin puree, evaporated milk, eggs, sugars, spices and salt. Mix until all ingredients are thoroughly combined. Preheat oven to 350F. Pour pumpkin mixture gently over cream cheese layer. Cover edges of crust with aluminum foil and bake in preheated oven for 25 minutes. Remove foil from edges and bake an additional 25 minutes. 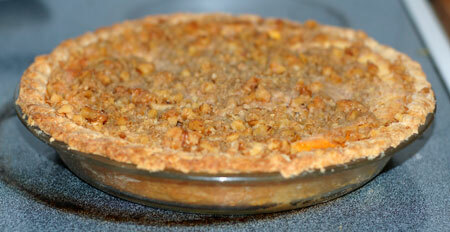 Streusel Layer: While pie is in oven, combine flour and brown sugar in a small bowl. Mix well, then add softened butter and stir until ingredients are combined. Mix in nuts. After pie has been in oven for 50 minutes, remove and sprinkle streusel evenly over top. Bake for an additional 10-15 minutes, until a toothpick inserted in center comes out clean. Allow to cool, and serve chilled with some sweetened whipped cream. And if that’s not enough beta carotene for you, I’ll be writing up a post in another few days about a less conventional dessert I made with a portion of my leftover sweet potato puree: sweet potato-maple pecan ice cream. As a final side note, I also found the time to clean and roast the seeds from my little sugar pumpkin. I rinsed and boiled them in salted water, then tossed them with a bit of melted butter and alder-smoked salt, and roasted them in a 400F oven until they were golden brown and crunchy. They were a perfect snack to munch on while we waited for Thanksgiving dinner to finish cooking. 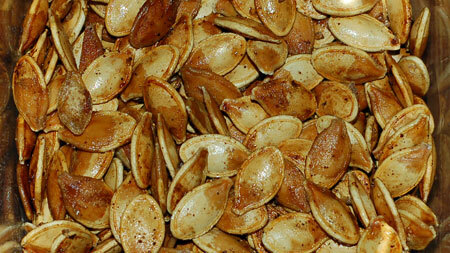 Guidelines for toasting pumpkin seeds can be found here and here. This pie sounds amazing!! I’ve never roasted my own pumpkin before. That’s ambitious! It takes a little time, but shockingly little work. No different from roasting any squash, really. The hardest part for me was finding sugar pumpkins instead of the carving kind. We had to drive up to the Whole Foods in Tigard (about 40 minutes away) to find them. Even plain pumpkin will work if you roast it first. The caramelization produces sugars and makes it sweet. So nice to see a cheesecake layer and nuts, too!